It is hard to learn a new language. Use the 15 ESL learning tips on this page to help you learn faster and better. You do not need to use all the tips, or even most of them, as long as you find just one or two that help you, you will become a better learner. 1. Short sessions – Work for ten or fifteen minutes each time rather than for one hour or more. It is easier to learn by having many short sessions rather than one long one. 2. Use your wasted time – Everyone has some time each day they do not use as well as they should. This could be when you are traveling to work on the bus or when waiting for your next class to start. Use these short periods of time to learn English. Always carry something with you that you can learn to fill in this wasted time, such as flashcards or a phone app. 3. Repeat and revise – Once you have learnt something you can move onto a new topic, but you should still come back and revise what you have learnt. Once you have learnt something come back and revise it a week later, than again two weeks later and then again after a month. Keep coming back to make sure you have not forgotten anything. This does not have to take long. Just spend one fifteen minute session revising each topic every few weeks. This will make sure you have really learnt the information. 4. Move forward – Do not get stuck on the same topic forever. No matter which ESL learning tips you use, always try to move forward. Spend enough time to learn something, but not too long. Learn as much as you can and move forward to the next topic. You can always go back and revise previous topics every few weeks. But the overall progress should always be forward and not static. 5. Find friends to help – It is always nice to see and spend time with friends. Just try to learn English at the same time. Meet up with friends a few times a week to practice English. If you not have any friends who want to learn English you could find some new ones using the Internet who will help you. If you work in a group you will be able to support each other and help each other. 6. Use the Internet – The Internet is a great resource of just about anything you could want. 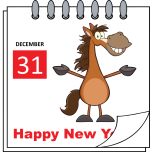 Use it to find material, exercises, activities, test or anything else that will help you learn English. There are ESL forums you can visit or ESL websites. 7. Use Skype to talk with people – The most difficult ESL area to learn is conversation (speaking and listening to someone else). You can use Skype to find people to talk to from all over the world. The more you speak, the better you will get. So use Skype to connect with people to talk to. You will generally be able to find people to talk to on ESL forums. You can meet them there and then give them you Skype contact details (be careful about who you give any personal information to on the Internet). 8. Listen to English radio or watch English television – Once you are quite good at English you will be able to watch and listen to English being use by native speakers in natural situations and understand what is happening. Once you are good enough to do this you will be able to get better quite fast as there is so much material to choose from. 10. Be focused – There are always distractions, ignore them. Chose an ESL topic and focus on it until you have learnt it. Do not half learn something and move on to something else. This is not good as you will forget much of the first topic as you have not learnt it fully. So be focused and learn something properly before moving on. 11. Ask for help – Sometime you just need someone to help you. This could be to give you an independent test or to suggest what you should do next. This is good as another opinion about anything is usually very good. You could either ask a friend or pay a tutor to help you for an hour or two. If it keeps you on the right track it will be money well spent. 12. Start with vocabulary – The basic blocks of any language are the words and what they mean. If you do not know the word for something, you cannot speak or write about it or understand when you hear or read the word. Therefore, when learning about any topic area, always start with the vocabulary. Learn all the vocabulary first, use flashcards or an app, whenever you have free time. Then you will be ready to use the vocabulary when you need to read, write, listen or speak. 13. Area pairs (reading + writing / listening + speaking) – The skills needed for reading and writing complement each other so learn them together, while the skills for listening and speaking also go together. For one or two days focus on reading and writing and then for the next few days focus on listening and speaking. 14. Learn from mistakes – Do not be afraid to make mistakes and have other people tell you what they are. Many people are embarrassed about other people seeing their mistakes, so never show anything that might be wrong to other people. If you do this, you will never get better. Other people will be able to correct your English and help you get better. By having someone tell you your mistakes you can improve those areas and get better. 15. Do not work too hard – You might have a deadline to work to, but do not work too hard. Take some breaks and have some rests. Your brain needs time to stop and process what you have learnt. When you get too tired go and do something else for a while, or go to bed and do more tomorrow. 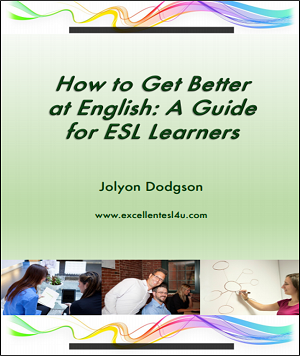 There are more ESL learning tips in my free ESL book ‘How to Get Better at English: A Guide for ESL Learners’. 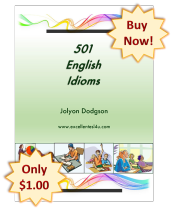 One chapter of the book is full of 10 ESL learning tips. All you need to do to get the book is sign-up to my ESL 4U Ezine. Fill-in the two boxes below and then when you have conformed your email you will be able to download the book.